A quick trip down U.S. Hwy. 301 in Riverview illustrates a massive housing boom occurring as builder signs are popping up everywhere touting new communities coming soon. KB Home, Meritage Homes, Beazer Homes, Express Homes and Ryan Homes are just a sampling of the builders’ who are busy clearing land and building new communities. According to Commissioner Sandy Murman’s office, 883 new home building permits have been pulled for the Riverview area between September 2013 and September 2014. The report was pulled to include single family homes, condos and apartments. There were no permits issued for condominiums during this time period. Local builders report more than 1,500 homes are on the way, under construction or ready for move-in. KB Home is currently developing a new community in Riverview, Medford Lakes as well as selling new homes in Ibis Cove in South Park, both locations along U.S. Hwy. 301 S. Medford Lakes, situated at the intersection of Berner Lane, will have a total 214 homesites and is anticipated to be completed by April 2015. KB Home will be offering single family homes ranging from 1,500 to 3,000 sq. ft. and pricing is anticipated to start in the mid $200’s. Medford Lakes will have an amenity center with pool and cabana. KB Home is also selling new homes in Ibis Cove at South Park, a master-planned community that includes two amenity centers, both with a pool, clubhouse, basketball court and playground. Single-family homes that range from 1,700 sq. ft. up to more than 3,700 sq. ft. are now available. Pricing starts in the $180’s. “KB Home has seen much success in the Riverview market and continues to focus on future land opportunities to build new communities in the area,” said KB Home Director of Public Relations, Cara Kane. Heading South on 301, from KB Home’s Medford Lakes, D.R. Horton’s new community, Riverview Meadows, offers homes starting in the $180’s. Floor plans range from 3-5 bedrooms and span from 1,844 to 3,579 sq. ft. There are more than half a dozen models ready for move-in and a total of 200 homes will be built. Park Creek is another new D.R. Horton community under construction on U.S. Hwy. 301.This 400-home community is nestled among beautiful oaks, creeks and ponds and touts itself as one of the only communities in the country to offer ULtraFi, one gigabite internet. Lush tropical landscaping adorns every lot making each home its own private oasis. There is a 4,200 sq. ft. clubhouse, beach-entry pool and shaded playground. Homes at Park Creek range in size from 2,045-4,363 sq. ft., include one- or two-stories, have three, four and five bedroom floor plans, and are available with two- or three- car garages. Additional information can be found at www.drhorton.com. 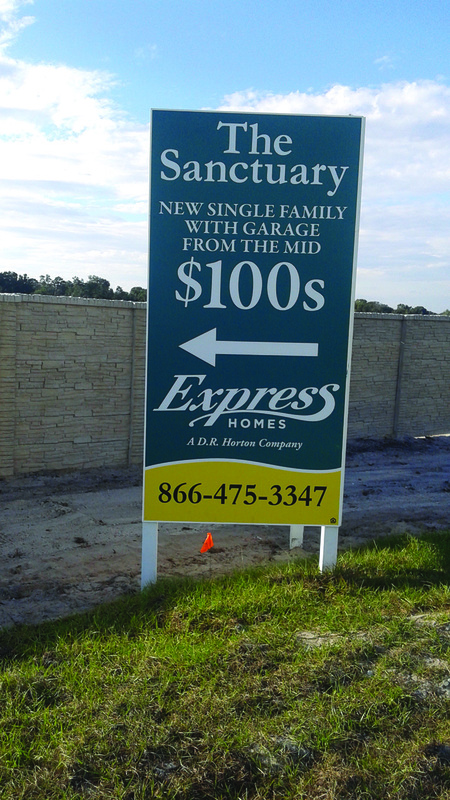 Express Homes plans to open two new communities in Riverview in the coming months. The Sanctuary, located on U.S. Hwy. 301 South of Symmes Rd., will host its grand opening on Saturday, November 8 and Copper Creek, located off of Big Bend Rd. at I-75, is expected to start sales in March 2015. The Sanctuary plans to offer 180 single-family homes ranging from approximately 1424-2447 sq. ft. with prices ranging from $169,990-$204,990. The community will be a great place for families and feature a tot lot. Copper Creek will offer 208 townhomes from 1530-1674 sq. ft., with prices expected to start in the mid-$100’s. For additional information about the Sanctuary and Copper Creek, contact sales agent Erica Delgado at 866-475-3347. Express Homes, a D. R. Horton Company, can be reached at 866-475-3347. Visit www.expresshomes. com/Tampa for further information. Meritage Homes is a new emerging builder in the Riverview area with new single-family homes available in three communities. Meritage Homes has been around since 1985 and is now selling in Waterleaf on Big Bend Rd. 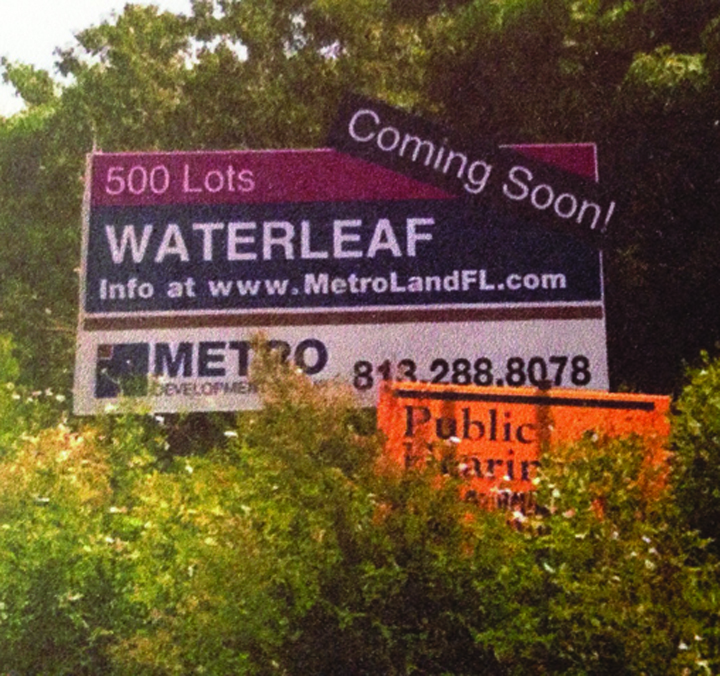 in the Summerfield area, Riverleaf at Bloomingdale and coming soon, The Preserve at Riverview. Waterleaf is a private gated community of new, incredibly energy-efficient homes ranging from 2,516-3,188 sq. ft. Homes range from $287,990-$325,990. In addition to Meritage Homes, David Weekley Homes, Standard Pacific Homes and Homes by Westbay are building in Waterleaf. When the community is completed, it will boast 600 homes. The Preserve at Riverview, also a Meritage Home Community located just off U.S. Hwy. 301 and Symmes Rd., has completed land clearing and is currently offering pre-sales of new homes ranging from 2,581 to 3,467 sq. ft.
Meritage Homes is also taking pre-sale orders for Riverleaf at Bloomingdale. Homes in this community will range from 1,963 sq. ft.-4,160 sq. ft. and are selling for $248,990-$405,990. “Every home we build helps showcase our commitment to providing incredibly energy-efficient homes that let you spend your money on better things than utility bills. After all, we believe in building new homes and communities the way they can, and should be, built,” claimed Meritage Homes’ Website. Information about Meritage Homes in these three communities can be obtained by visiting the Meritage Homes Waterleaf Sales Center, located at 11883 Frost Aster Dr., Sunday and Friday, 12 Noon-6 p.m. and Monday-Thursday and Saturday, 10 a.m.-6 p.m. For further information on Meritage Homes and its communities, visit www.meritagehomes.com. Ryland Homes is yet another builder taking a stake in the Riverview community. WaterStone Lakes offers an intimate setting with 99 homesites with desirable water views including two lakes and a community fountain. Prices in this community range from $199,900-$289,900 and homes are 1,679-2,708 sq. ft. There are a few models ready for quick move-in and more than 30 homesites still available. WaterStone Lakes is located just off of Gibsonton Dr. at 10406. Call 644-6865 or visit www.ryland.com for information. Pre-construction is expected to begin this fall at The Reserve at Pradera, located just off of Big Bend Rd. by I-75. Beazer Homes will offer new single-family homes ranging from 1,800-4,500 sq. ft. priced from the mid-$200’s. There will be 55’ Manor and 65’ Estate homesites on both water and conservation. The amenities center will open in spring 2015. To find out more, visit www.beazer.com. Ryan Homes also has a presence in Riverview with new homes available in four different locations. Lucaya Lake Club is a beautiful community featuring a 78-acre lake, lakeside clubhouse with fitness center, resort-style pool, boat ramp and floating dock, playground and parks including a splash park. Ryan Homes is offering five floor plans, all offering four bedrooms and two and three-car garages, priced from $225,900-$311,990. Many the homesites front lakes and fountains. Plans call for multi-family housing on the property in the future. Visit www.lucayalakeclub.com or call 442-8951. Lucaya Lake Club is located on Rhodine Rd. just East of U.S. Hwy. 301. At Providence Ranch, located at the intersection of Riverview Dr. and Providence Rd., Ryan Homes will build 25 homes, ranging from 2180 sq. ft.-3500 sq. ft. priced from the mid-$200’s to the mid-$300’s. Pam Malone of Ryan Homes reports that roads are going in now and new home construction should begin in late November of early December. The land clearing on Rhodine Rd. east of Balm Riverview Rd. is making way for Bell Creek Preserve. Ryan Homes will build 150 homes. This will be a no CDD, non-amenitized community. Homes will start at 1,650 sq. ft. and prices have yet to be determined. Homebuilding is expected to begin in January 2015. Ryan Homes is also building 32 homes at the Enclave at South Fork, located on U.S. 301 South of Big Bend Rd. Homes in South Fork will range from 2180-3500 sq. ft. and are priced from the mid-$200’s to mid-$300’s. South Fork is an established community will full amenities including a pool, clubhouse and tennis courts. The Ryan Model Home will open on Monday, November 10. “It is a great location with easy accessibility to major roadways, shopping, downtown, MacDill and more,” she said. “The area also is quite reasonably priced.” For more information about Ryan Homes, visit www.ryanhomes.com. The aforementioned communities are just a glimpse of what is to come in the Riverview area as more land clearing is going on along Balm Riverview and Rhodine roads as well in other areas. Keep reading the Osprey Observer for updates on new communities, roadway, infrastructure improvements and more that are still to come.